As I write this, the Conclave to pick a new pope begins in about five to seven hours. Since 17 February, I have loaded on this page, which you can scroll below to see, a detailed and prophetic overview of the prophecies of St. Malachy describing the final pope on his list before Judgment Day. That pope could be chosen by this Conclave. 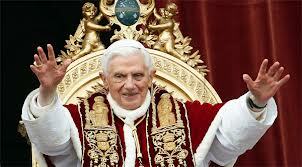 I have made predictions that nearly a year to the day forecast Pope Benedict would resign, because of many scandals. On this page, I have corrected the sloppy work of most media journalists concerning the rare precedent of popes resigning when it is usually expected you leave the Apostolic Palace only red slippers first in death. I shared with you secrets of a great pope’s poisoning, prophecies of Apostasy and gave you pathways to search out the candidate for the Antichrist. Below I have shared information about those Cardinals most likely to fulfill the exact clues left in St. Malachy’s prophecies that might point the finger of fate at the papabille, those believed most likely to become pontiff. As I rush to complete this article, one of them might soon shuffle in and be locked behind the great wooden doors of the Sistine Chapel and thus on Tuesday, Wednesday, no later than Friday, he will emerge as Petrus Romanus, Peter of Rome, the Last Pope. Be the first to find out who that is by subscribing to the free HogueProphecy Bulletin. One last thing I must confess and document before the key is turned to lock them in for the Conclave. I must conjure a second, great Catholic visionary and impart an interpretation from Nostradamus. I must provide as best I can his clues to whom the next pope, perhaps the last pontiff, will soon be in a little less than four days. We look upon two quatrains (four-line verses) that speak directly to anticipating the outcome. They come from Nostradamus’ magnum opus, his history of the future, written in the mid-to-late 1550s, called Les Propheties (The Prophecies). Who will not be too conforming to the Romans. The sequence of succession makes the sound remarkably contemporary because Pius XI (1922-1939) actually was pope for 17 years. That makes his five successors Pius XII (1939-58), John XXIII (1958-63), Paul VI (1963-78), John Paul I (1978), and finally John Paul II (1978-2005). Benedict XVI thus came after John Paul II in 2005 and the final line hints that his ascendency would not please the Vatican bureaucracy. As I later describe below, St. Malachy’s prophecy calls Benedict De gloria olivae (from the Glory of the Olive). This hints of parallels to other prophecies forecasting either a Benedictine monk or someone named “Benedict”, becoming pope – defined as the harbinger of prophecies uttered by Jesus Christ in his sermon on the Mt. of Olives. It is otherwise known as the Little Apocalypse, rife with wars and rumors of war. Catholic prophecy watchers believe this passage recorded in Luke and Matthew dwells mainly on a coming Apostasy of faith from those most high in the Catholic Church. It was thus expected that Benedict would see his pontificate marred by a crisis of scandals and faith; moreover, as I apparently and correctly read the signs (below), Benedict would be forced to resign. 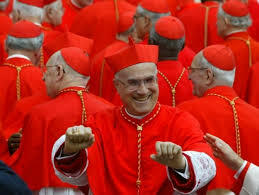 Now then, as Cardinals are soon locked away to cast their first ballot on the afternoon of 12 March in Rome, and subsequently four ballots each day thereafter until a pontiff is chosen by 77 of them (two-thirds plus one of 115 members of the sequestered College of Cardinals), we will see if the Holy See will shift in direction. Will 2,000 years of European born pontiffs relinquish control to a Cardinal from the developing world, where Catholicism still flourishes? I have already stated below that it is highly likely to be an Italian this time: a Cardinal Scola or even the Camerlengo, Cardinal Bertone. The Italian Cardinals have the largest block and along with the other European and North American blocks, have a dominant vote to ensure another European resides in St. Peter’s chair. It is important to note that the real division now developing between the College of Cardinals in the Conclave divides the camps between a conservative and pro-Curia, pro-Vatican bureaucratic faction and an anti-Curia, evangelical, progressive faction. In short, if this were American politics and the men in holy drag were American politicians; the parties divide between pro-Washington DC and outside Washington DC contenders. It gets even more murky if you factor in that both factions, Bertone’s bureaucrats of the Curia and the progressives agree that the next pope should be vital, strong, an evangel of the Church, a man that inspires the world, like John Paul II once did. A younger man. Not a shrinking and creaky old theologian. 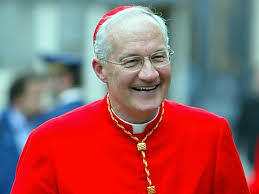 Not a Pope George W. Bush of Pontiffs, that is: a good Theologian but a mediocre chief executive. 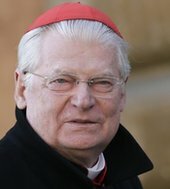 If the non-Curial faction can find common ground with the conservatives running the Vatican then the developing world’s best choice for a Pontifex Maximus (a great bridge between conservative and progressive Catholic teachings would be the Archbishop of Sao Paulo, Brazil, Cardinal Odilo Pedro Scherer. He is also a bridge of heritage, half-German and half-Brazilian. 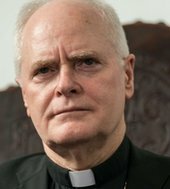 He will not get St. Peter’s ring without the Curia faction’s ascent and the rumblings within the Vatican is that he has failed to stem the tide of Protestant Pentecostal conversions in his flock. 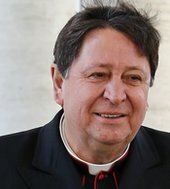 The same Curial disappointment overshadows a Curial block vote in favor of the Archbishop of Brasilia, Joao Braz de Aviz. Those of us reading these lines from the mid-1550s must remember that the “Spain” of Nostradamus’ day was a vast Empire that covered Central and much of South America. These too would comprise “Spain”. The coyness of line might imply more than meets the eye if we consider a Canadian Cardinal and Archbishop of Quebec, Marc Armand Ouellet. His father’s name was Pierre (Peter). Ouellet is an ancient French name given to a family of Quebecois, once the oldest colony of France in the New World. 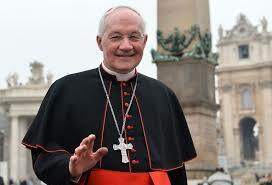 He is a Curia insider, being the prefect of the Congregation of Bishops and a member of the Secretariat of State. He believes lay Catholics had too liberally interpreted Vatican II reforms yet he is known by those who work with him as moderate and flexible – a sign that he could work with the progressive wing. His weakness is that he is no bigger-than-life evangelist like John Paul II. However, like Scherer and de Aviz, he is far younger a choice than was the Pope Emeritus in retirement, Benedict XVI, given the job when he was at what now seems in retrospect the overly ripe old age of 78. The most intriguing prophetic factor marking this Cardinal as perhaps the man destined to steer the “trembling ship [the Bark of St. Peter] is that he didn’t “come” from Spain but he did live in “Spain. Ouellet taught in seminaries in Columbia, South America (that’s part of “Spain” in Nostradamus’ 16th-century thinking). Moreover, Ouellet is well known and widely regarded in South America, speaking fluent Spanish and Portuguese along with his knowledge of English, French, Italian and German. Whoever the pope in question is, the final two lines of Nostradamus’ quatrain parallel the horrific final coda of St. Malachy’s tale of the ministry of the last pope that you can read by scrolling below. Astrologically speaking, the pope to be chosen in the next few days after a new Moon in Pisces, with a Sun in Pisces and Mercury in the final week of its retrograde will be destined to run a pontificate that is dreamy as well as emotionally and subconsciously murky. Let alone a pontificate that will have a hard time communicating to a world moving ahead of it, as all major aspects will be anchored in the “fin de siecle” of the ending Piscean Age. It seems only right that the last pope in St. Malachy’s prophecy should have a pontificate born in Pisces, thus marching forward into the new Age of Aquarius, which has just begun, boldly looking in the rear-view mirror of the Piscean past. Do mean That the 266th Pope, has arrived, who will be poisned and the begining of the 3rd world war?